Do you have a question for the Power BI Team? Get your answers at today's Power BI Ask Microsoft Anything (AMA) event on the Power BI Community! 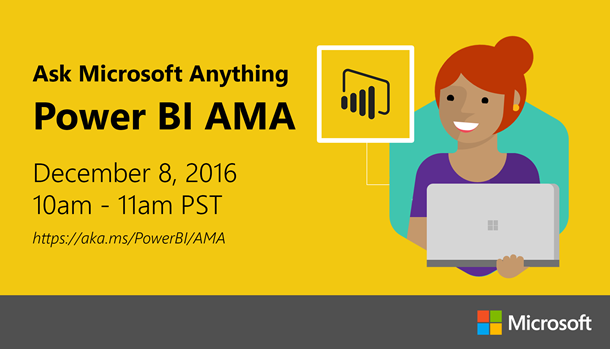 The AMA will take place in the Power BI Community AMA board, today from 10:00 A.M. to 11:00 A.M. PST. An Ask Microsoft Anything (AMA) is the same as an “Ask Me Anything (AMA)” on Reddit, or YamJam on Yammer. It provides the opportunity for the community to ask questions and have a discussion with a panel of internal and external experts on a particular topic. In order to get the best value out of this hour, take a look at the flow & etiquette guidelines. This is your opportunity to ask questions and share feedback directly with the Power BI product team! The Power BI Community is a place to connect, learn, and discuss with business intelligence experts and peers. Whether you need help and support, want to explore exciting new features or have tips and best practices to share, the community is the place for you. To get started take a look at this guide for tips on registration and exploring the community. Please let the Power Bi Community team know if you have any questions. We look forward to seeing you in the community and at the AMA!